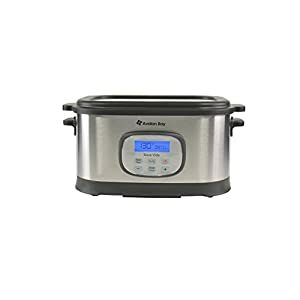 Tags: cooker machine, cooker system, culinary, PSV-00179, recipe, slow cooker, sous vide, sous vide amazon, sous vide cooking, sous vide cooking equipment, sous vide machine, sous vide water oven, sous vide water oven cooker, water bath, water oven, water oven cooker. The PSV-00179 sous vide cooking technique has been the secret of great chefs worldwide for decades and yet it is so simple, even a beginning cook can do it. 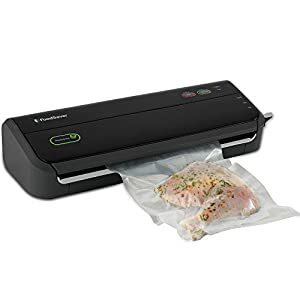 The process involves vacuum sealing food in cooking pouches and submerging them in a precisely-controlled water bath held at a constant temperature. 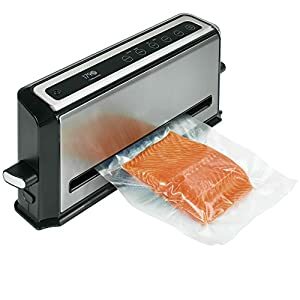 Unlike the hostile high temperatures of the stovetop, oven, or grill, the SousVide Supreme water oven gently and precisely cooks the most delicate fish or the toughest cuts of meat to tender perfection every time. 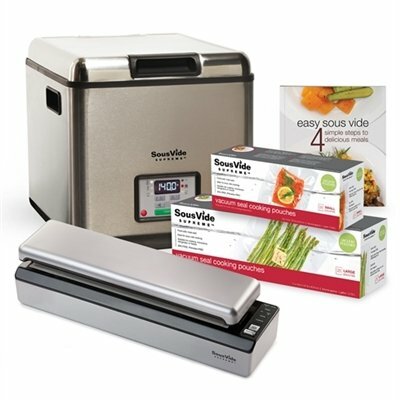 There are just 3 simple steps to sous vide cooking: season the food, vacuum seal it, and drop it into the SousVide Supreme water oven at the desired temperature. It’s really that easy! 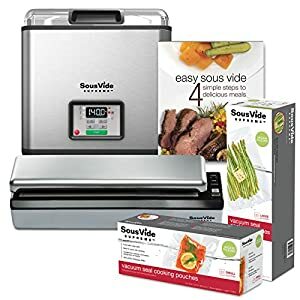 The award-winning PSV-00179 SousVide Supreme water oven maintains a constant, very precise temperature, making it virtually impossible to overcook or undercook food. Cooking in conventional ovens or on the stovetop or grill, requires a degree of skill (or guesswork) to perfectly time the process and know exactly when to remove the food from the super hot environment. 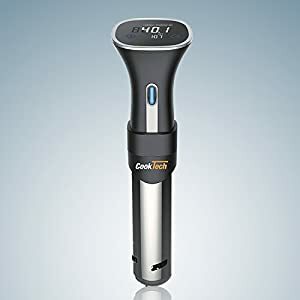 Sous vide cooking relies on precision in temperature, which can be set at the touch of a button by anyone, completely eliminating the risk of undercooking or overcooking. 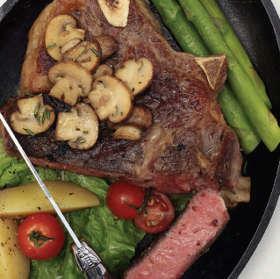 Each food cooks at its ideal temperature to consistently bring out its very best. For instance, to cook a steak, guaranteed medium-rare, simply set the water oven to 134°F/ 56.5°C. At this precise temperature, once the meat has heated through, it will be cooked perfectly medium rare from end-to-end and edge-to-edge, every time. No more guesswork. No more charred edges or rare centers. Another great advantage is that the process isn’t time critical. Once cooked, the steak can remain in the water bath for hours and will not overcook; it will still be medium rare and ready to eat when you are ready to serve. No more expensive meals ruined by unexpected emergencies or late arriving guests. Sous Vide Cooking Ensures Maximum Flavor and Nutrition! Preparing food sealed in a cooking pouch means that all the natural juices and water-soluble vitamins and nutrients remain with the food. They aren’t boiled off in cooking water or steamed away like in conventional cooking. 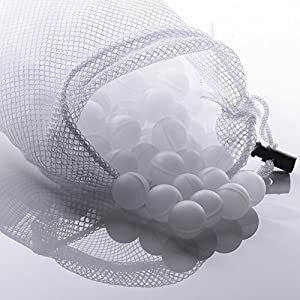 The sealed pouch protects the delicate healthful fats in cold-water fish and game that can be damaged by exposure to oxygen and high heat. 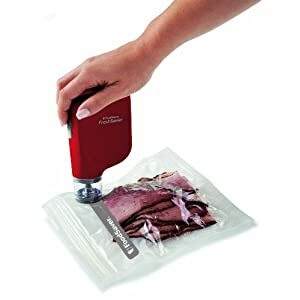 Food cooked in the SousVide Supreme water oven not only retains its nutrition, color, and form, it shrinks far less, giving you more for your money. And because the food cooks in its own juice, there’s no need to add butters and oils to moisten dry meat or vegetables anymore. Everything cooked sous vide is perfectly delicious on its own, its natural flavors enhanced by the process. Dry, tasteless meats and limp discolored vegetables will become a thing of the past. There are two basic types of sous vide equipment: water ovens (such as the SousVide Supreme appliance) and immersion circulators. Both types offer the precise temperature control necessary for safe sous vide cooking, but operate differently. 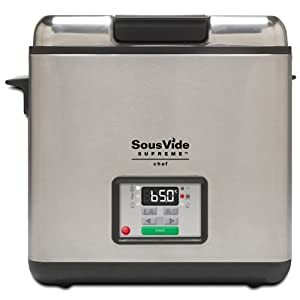 Unlike the single point heating systems of immersion circulators, which require active circulation to disperse the heat, the SousVide Supreme water oven’s patented design and precision temperature control technology ensures even temperatures without the need for a circulator motor or pump. As heat rises from the edge-to-edge heating element that blankets the base, it creates highly efficient thermal convection currents that maintain consistent temperatures throughout the water bath without the need for agitation. 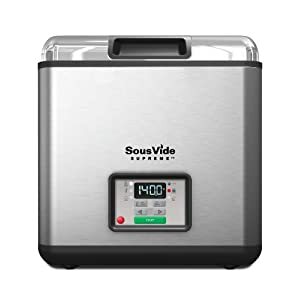 The PSV-00179 SousVide Supreme water oven also features a cool touch housing with its double-wall insulated design and a lid to contain steam and prevent evaporation of water during cooking, ensuring maximum heating efficiency and energy savings. Additional features include silent operation and no moving parts that can be hard to clean and require regular maintenance, repair, or replacement. Gourmet taste. Capture the full flavor of foods. Added nutritional value. Natural juices and nutrients remain in the food in the pouch. Saves you money. Tenderizes tough, inexpensive cuts. This versatile appliance can perfectly cook almost anything, including all types of meat, game, fish, seafood, poultry, fruits and vegetables. It can also be used to make perfect poached eggs, yogurt, crème brûlée, caramel sauce, ice cream base, oatmeal, pickled vegetables, and infused alcohols and syrups for cocktails. The list is endless! 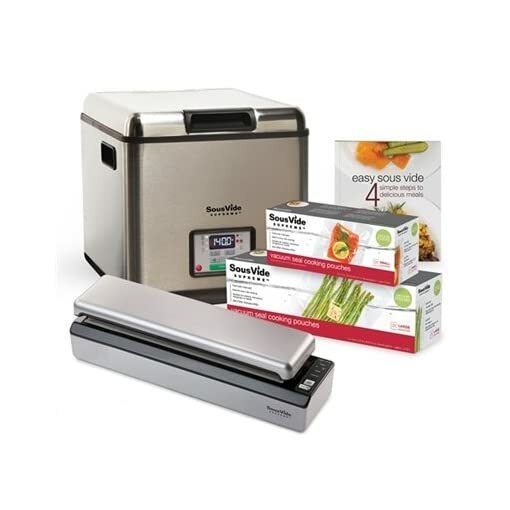 The PSV-00179 SousVide Supreme water oven offers unparalleled cooking convenience in a compact countertop appliance. Meal planning is easy, as food can be seasoned and sealed ahead of time and then cooked direct from the fridge or freezer by simply dropping it into the water oven at the set temperature. 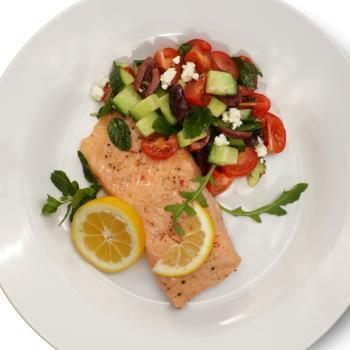 You can leave it to cook for as little as 15-20 minutes for fish or all day for certain meats, but it is hands-off and guaranteed to be perfectly cooked, and it let’s you do what you need to do while it is cooking.